OK! I admit it. I have a problem. At first it was interesting, even quaint. Then it became mildly neurotic, with close friends beginning to question my actions. Now, I’m afraid, it’s a full-blown obsession and I’ve been urged to seek help — until the concerned individual learns that s/he will be receiving the fruits of my addiction. How quickly concern becomes encouragement. Enablers all! To think, I was happily satisfied with my frozen stash of muffins and cherries. Thrilled that my cherry pie had been well-received and was good to the very last bite. All in all, there was certainly no need for me to seek out more cherries — until I noticed a “Jam” category at Tanya’s wonderful ChicaAndaluza blog. Lo and behold! Just a few short weeks ago, she made cherry jam. My heart raced as I read her post. Ah! She canned her jam and I don’t can. (I suffer from botulismaphobia.) My heart beat returned to normal — but wait. She canned them without a water bath. How could this be? I used her post’s comment section to ask if it were possible to can something without a hot water bath, knowing full-well that it would be days before her answer was received, long after yesterday morning’s trip to the farmers’ market and, presumably, after this season’s tart cherries were gone. I was in the clear and the few remaining tart cherries within the tri-state area breathed a sigh of relief. And then the unthinkable happened. Tanya answered my question within 2 hours. TWO HOURS!! I knew instantly that I was doomed. Yesterday morning, Saturday, in the middle of a driving rain storm, Max & I headed to the farmers’ market. I promised myself that we would turn around and come home if the rain didn’t let up. In fact, it got worse as we drove north toward Evanston. Confidently, I drove onward. And then, about 1/2 mile from the market, it was as if Moses himself had waved his staff. The clouds parted and the rain stopped completely. Again, my heart began to race. Upon parking the car, I went immediately to both fruit stands that had, unwittingly, fed my addiction in prior weeks. There were no sour cherries to be found at either location. Relieved, I went about buying an assortment of vegetables — I’ve giardiniera to make. Within minutes, my shopping bags were full and I was headed back to the car, where Max and the traffic coördinator had been keeping company. That’s when I saw them. 8 quarts of tart cherries where, just minutes before, there had been none. The young woman apologized. Something about the rain. Arriving late. Being short-handed. I don’t really remember what else, if anything, was said; my head was reeling. I pointed to 2 quarts, paid her in silence, walked backed to my car, and drove home, managing to avoid looking Max in the eye the entire trip. Forget about whatever had been planned, the day had become cherry jam day. Never having canned anything before, I referenced 3 sources. Tanya’s Summer Cherry Jam recipe, of course; David Lebovitz’s No-Recipe Cherry Jam; and the pectin envelope’s instructions. I pitted the 2 quarts of cherries and they yielded 3 lbs of cherries and juice. I reserved 8 oz, put the remaining portion into a food processor, and pulsed until the cherries were coarsely chopped. I then returned the whole cherries to the mix, per Lebovitz’s suggestion to keep a few cherries unchopped. The jars, all new, were washed in my dish washer, using the “sanitize” cycle. The lids were washed in warm soapy water, rinsed, and then placed in a deep bowl. 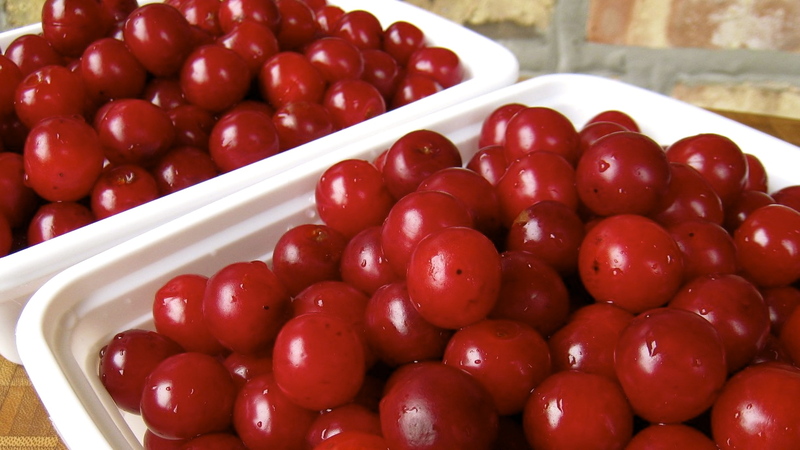 While the cherries were being cooked, boiling water was poured over the lids and they remained in the water until needed. 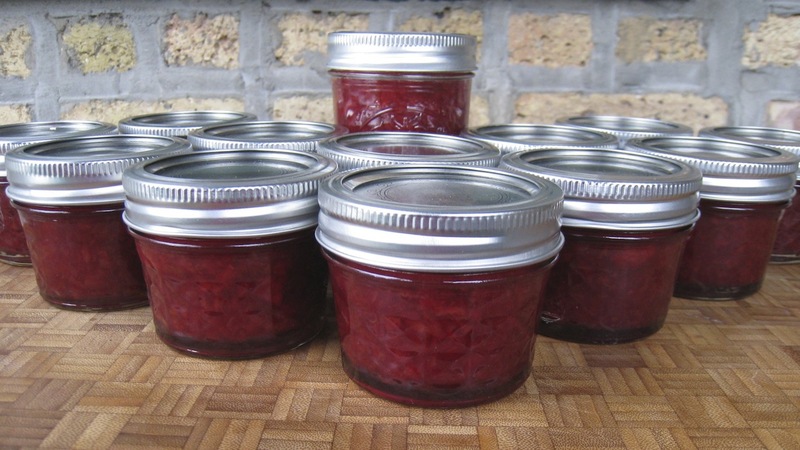 With everything now prepared, I followed Tanya’s recipe and made just about 7 cups of cherry jam. Thanks to Tanya, my first foray into canning wasn’t nearly as painful as I had feared. Even so, I think I’ll limit my future canning exploits to the making of jam. No need to press my luck. We will NOT be going to the Skokie Farmers’ Market today — I think. 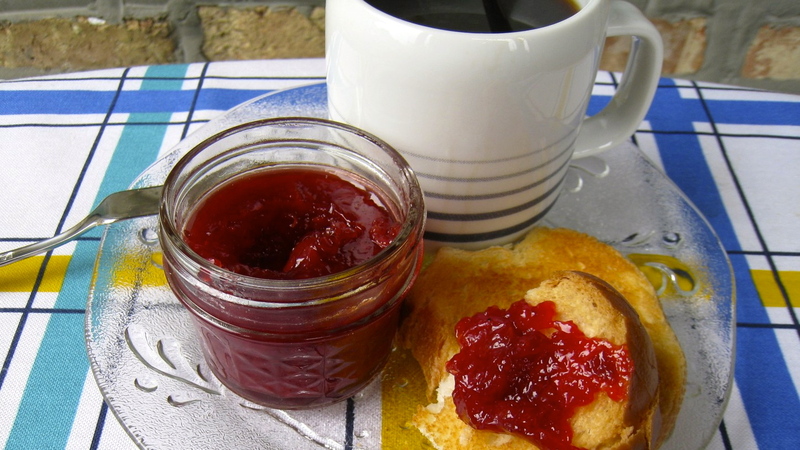 This entry was posted in Condiments & Snacks, Sweets (Dolci), Vegetarian and tagged Food, Jam, Tart Cherries by ChgoJohn. Bookmark the permalink. Does anyone know of a resource to help with blogging interventions? at the least, maybe help with tart cherry addiction? Well, you can always resign your commission as one of the official taste testers of the Bartolini kitchens. With no one to eat these goodies, there’s only so much that can be made and stored. and leave you to pick who’s to play me in the Lifetime Original movie of your blog’s story? Never. Bring on the taste testing. Bradley Cooper has been contacted to play me, Tester #1. So glad someone else is on the can bandwagon. I loved Chica’s jam recipe. Cherries are pretty pricey here. Plus I think if I make one more jam, my storage cabinet might buckle. These look fantastic. I wouldn’t say I’ve hopped on the can bandwagon, but I did check out the ticket prices. All my jars sealed but I still put them all in the fridge. Just when I think I’m cured, botulismaphobia rears its ugly head, yet again. I cannot tell you how excited I am for you that your botulismaphobia is on the mend! The jam looks wonderful and I´m so happy that I might have been able to influence it in the tiniest way. Shame we can´t all get to taste each other´s jams as I bet they all taste very different with these wonderful local cherries that we are using. Yay for canning and a big congratulations to you on losing your cherry (am I allowed to say that?!). What a lovely Monday morning read! Thank you for putting a happy smile on my face! So, when do you send me a bottle to sample? It was worth asking. And thank you for returning the favor by putting a smile on my face. The idea of me, an amateur, sending you, an accomplished chef, anything, let alone one of my first jars of jam, gave me a good chuckle. Enjoy the day. Gotta go pick the black cherries, before the cedar waxwings eat them all! They’ll make a nice spread to go with brebis. You don’t know me but yet you do, too well. Just last night, less than 24 hours after my first “jam session,” I found myself in front of a canning display. I started thinking of all of the Michigan strawberries and blueberries that are currently flooding the farmers’ markets. Thankfully, I had a moment of self-awareness and practically ran away from that display.I don’t need to start canning. I won’t start canning. No. Not me. Never… I need help. You just need help in the kitchen… and maybe an extra cabinet or 3 to store all those goodies! And therein lies the problem, I’ve no storage space for the equipment nor the canned goods. As it is, if everyone returns the jars I’ve sent out filled with giardiniera, pickles, and now jam, I’ll be overrun with canning jars. Besides, in about 2 weeks, I’ll buy my first bushel of plum tomatoes, clean them, run them through a Roma strainer, and freeze them. That’s about as close to large-scale canning as I’m going to get. OMG, you’ve just diagnosed my problem! I too suffer from botulismaphobia! I love the idea of canning and see all these posts on canning, but have always thought it was too much work! Well now, you have changed all that for me now! Your jars look gorgeous, I’d love to have you as my neighbor!! Botulismaphobia is the syndrome of which no one speaks, yet it affects millions all over the World. Yes, I may have canned my first jam, but I consider myself to be living with this debilitating condition, not cured of it. As for our being neighbors, yes that would be great, although, you’re such a great cook that I’d probably ballon in size — but I’d certainly be smiling. And there’s always a need for mall Santas. Your cherry jam looks fantastic! And, after all, cherries are my favorite for muffins, jam, cobblers, pies . . . I believe you have inspired me to take the plunge next year when the cherry tree at work is fully laden! I think I have pictures in one of my posts from this year’s tree! Next year I’ll have pictures of jam! You can thank Tanya and her Chica Andaluza blog for the inspiration. Had it not been for her jam entry, I never would have even considered making jam. I checked out your pics of the cherry tree at your workplace. The pics were great but the cherries!. Oh, the cherries! I could not have gone to work every day unless I came home with at least a quart of cherries. You, obviously, are made of stronger stuff than I.
Oh, yeah! So good that I wish I had made more. Sour cherries are such a short season, which makes them all the more precious. I had better go check the recipe for next year’s sour cherries harvest. 🙂 You enabler, you! I am going to start canning, just not this year (so why do I have some canning jars in the basement?). I love cherry jam – I will be trying this at some point! Thanks. My cherry tree died so I am always on the look out to pick someone’s unwanted cherries. I also have your fear but I am slowly coming out of my shell. This post was great and funny and I love farmer’s markets. And now I need a zucchini plant, too.